Facts of Fire: Wood Burns. Block Protects. At an early age, we learn that concrete products protect us from fire – while wood burns. 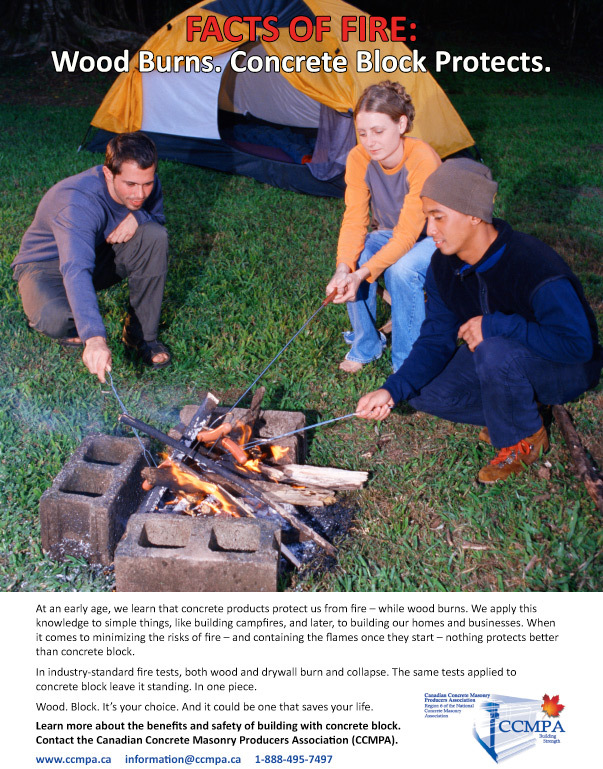 We apply this knowledge to simple things, like building campfires, and later, to building our homes and businesses. When it comes to minimizing the risks of fire – and containing the flames once they start – nothing protects better than concrete block. In industry-standard fire tests, both wood and drywall burn and collapse. The same tests applied to concrete block leave it standing. In one piece. Wood. Block. It’s your choice. And it could be one that saves your life. Learn more about the benefits and safety of building with concrete block. Contact the Canadian Concrete Masonry Producers Association (CCMPA). Fire fighters risk their lives to protect us.